Oak experiments yield mixed results. UK wine professionals were guinea pigs at a seminar yesterday as they tasted the results of Taransaud prototypes and product developments. Among the wines shown by the barrel maker were a Sauvignon from a wooden egg-shaped fermentor and a Chardonnay aged in a barrel designed to enhance the grape’s aromas and longevity. The event, dubbed “Oak and wine… the road to complexity”, comprised a series of presentations followed by tastings, some of which were blind, to illustrate the effects of oak shape, size and treatments on a wine’s flavour and structure. One of these concerned the effect of both shape and volume with a blind tasting of three Sauvignon Blancs from Domaine de Chevalier fermented and aged in a range of wooden containers all made using French oak. Among the vessels was Taransaud’s new egg-shaped 2,000 litre wooden cask called Ovum, which Domaine de Chevalier took delivery of in time for the 2011 vintage at a cost of €30,000. When compared with wines made and aged in both 225 and 400 litre casks, the wine from the egg-shaped container did not win the support of the room, with a show of hands among the 50 plus wine professionals present at the seminar picking the wine made using a 400-litre cask. Jean-Pierre Giraud, commercial director for Chêne & Cie, which owns Taransaud, expressed his lack of surprise at the result, and said that it supported a trend in the Loire towards the use of 400-litre oak casks for fermenting Sauvignon Blanc. However, it was suggested by Domaine de Chevalier technical director Remi Edange, who also praised the balance of the wine made in the 400-litre oak container, that the wine made in the Ovum would be more complete when the ageing process is finished. “The wines are only half way through their time in barrel,” he reminded those present, stressing that each of the samples had only spent six months in the different shaped containers. However, a tasting of Chardonnay from Givry using an experimental Taransaud barrel also failed to yield clear support for the cooper’s new product, which was called PFC. Using wines from the 2011 vintage made by Domaine Francois Lumpp, the wine from the prototype container was shown alongside an identical Chardonnay aged in a traditional 228-litre Burgundy barrel. A show of hands after the tasting of the two Burgundies revealed almost a 50:50 split in terms of taste preference, leading one member of the panel, Stephan von Neipperg from Vignobles Comtes von Neipperg to suggest blending the two wines. Speaking about the background to the taste test, Dominique de Beauregard, R&D director for Chêne & Cie, said that the PFC prototype barrel was adapted specifically to “reveal Chardonnay’s typicity and quality”, as well as “prevent premature evolution” by increasing the barrel’s antioxidant capacity. Other tastings focused on further product innovations by Taransaud including a barrel produced for ageing higher alcohol wines, which, Dominique explained, extract more toast aromas from oak. The new product, called A+, was used to house a Ribera del Duero from Bodegas Izquierdo for 12 months, alongside a standard Taransaud barrel, which contained the same wine for the same period. The two wines, which had an abv over 15%, were served blind, and like the previous experiments, those present failed to show a preference for the new product, with more than half the attendees, and Pingus winemaker Peter Sisseck, actually preferring the wine aged in the standard barrel. Despite such results, these tastings highlighted the focus on innovation at Taransaud and attempts to adapt barrel making to the trends over the last decade, whether that’s premature oxidation issues in white Burgundy, rising alcohol levels worldwide, or the growing interest in egg-shaped vessels for making and storing wine. 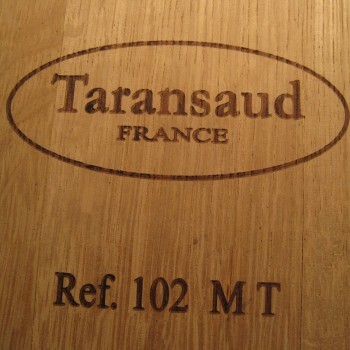 Finally, Taransaud proved its ability to enhance wine texture and character with its flagship T5 225 or 228-litre barrel. It takes its name from the five years used to season the staves before the barrel is constructed, and uses French oak with a very tight grain, as well as a “specific toasting procedure on a low intensity open oak fire”. In a tasting of Pomerol’s Château Beauregard from the 2009 and 2010 vintage using wines aged in a standard Taransaud barrel and the T5, the panel were unanimous in their support of the superior results from the latter vessel. “The T5 gives length to the wine, and makes it more elegant, but it doesn’t impose itself over the wine; amazing,” said Sisseck, after the tasting. The event yesterday (17 April) was also used to educate those present about the impact of wood seasoning on oak flavours and tannin quality, as well as the effect of both time and quantity when it comes to new oak usage. Notably, a tasting of Château Phélan-Ségur 2010 in an identical Taransaud new French oak barrels, but removed after 8, then 12 and finally 16 months in the vessels, showed that the longer period of wood contact produced a softer and more appealing wine. This entry was posted on April 18, 2012 by The Oenophiliac in News. and tagged Bodegas Izquierdo, Burgundy, Chardonnay, Chateau Phelan-Segur, Chene & Cie, Domaine de Chevalier, Domaine Francois Lumpp, Egg Shaped Barrel, French Oak, Givry, Ovum, Pingus, ribera del duero, Sauvignon Blanc, Taransaud, Vignobles Comtes von Neipperg, wine.